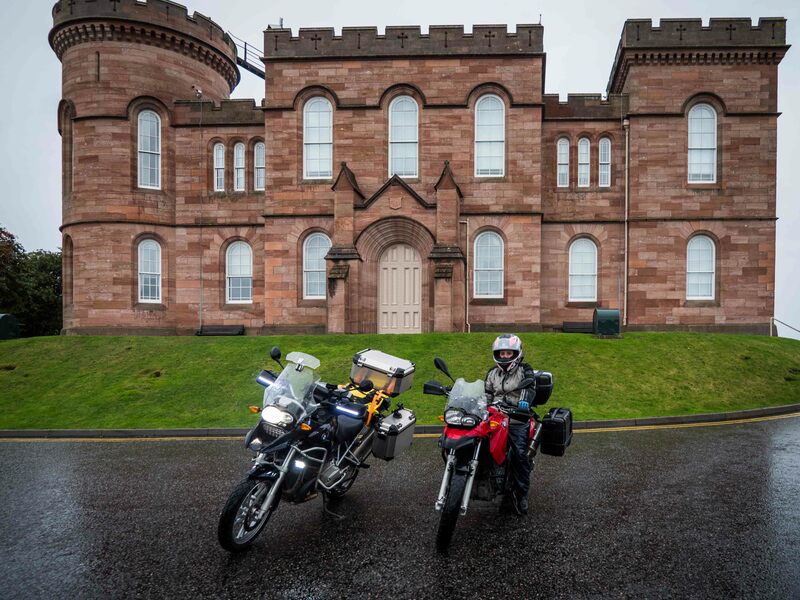 We started the day in Daviot, just south of Inverness and made the obligatory journey to Inverness Castle for our “starting” shot. From here we strayed off the official route to make a trip to Drumnadrochit. A small town on the edge of Loch Ness, it is famed as the centre for Nessie hunting! As the route doubles back on itself between Inverness and Buely, we wouldn’t actually miss any of the route, and would catch this leg at the end of our adventures! At the official “start” of the journey. We visited the Loch Ness Exhibition Centre, and spent an hour or so here. We found ourselves sadly disappointed, and felt a bit robbed of £8 a piece! The exhibit herded us through a series of rooms, in which each a short presentation played explaining the history of the monster in the loch. Although each video was well done, we would of liked more detail in each section. We felt that many areas were simply rushed to ensure each section was the same length. Hoping that the adjoining whisky shop would make up for this we trudged through the gift shop, but found a selection that barely rivalled that of our local Tesco. We did however find copies of my fathers children’s book still for sale! If you do visit Drumnadrochit, don’t leave without looking at Urquhart Castle. 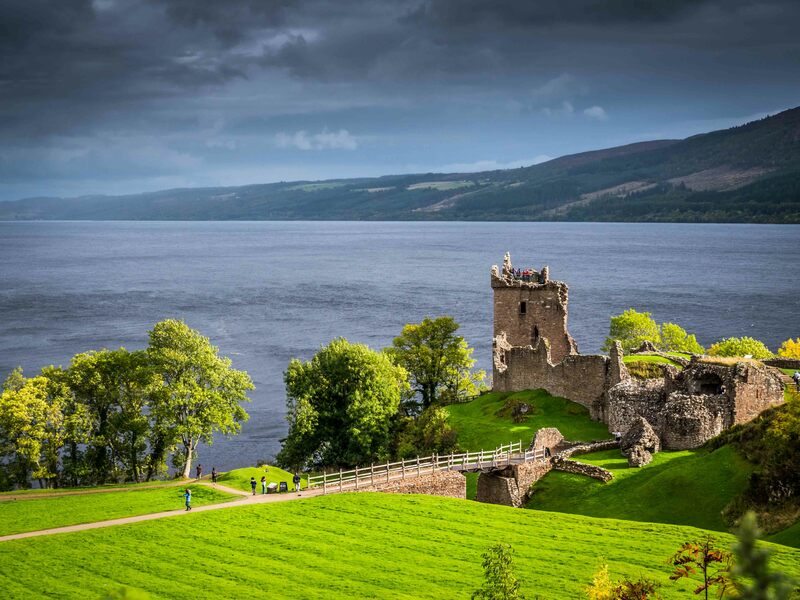 The famous ruins are open year round, and if you do visit keep an eye on the Loch; the castle’s prominent location makes it ideal for a bit of Nessie spotting. 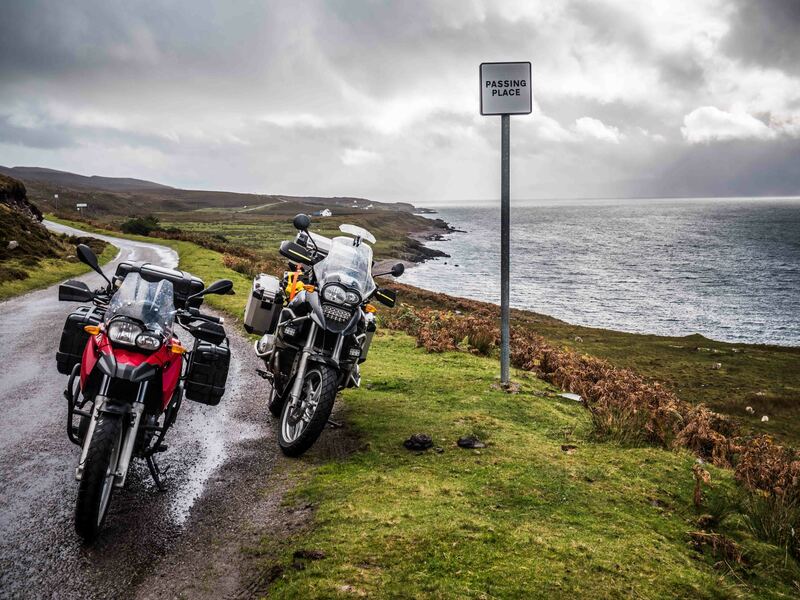 The plan for today had been to ride around the Isle of Skye, but with weather warnings in place for tomorrow with gusts of 60mph+ forecast we decided that today might be a slightly better day to tackle the Bealach na Bà. This infamous pass climbs and descends some 626m and is known for its steep climbs and hairpin bends. We started well, climbing into the descending clouds. It is worth remembering that this road is used by locals as a daily commute as well as fellow travellers. Remembering to pull into passing places when you see oncoming traffic will keep everyone happy! We managed to take a few photos and had a little bit of fun playing “chicken” with the gusting winds. Ian came a cropper after pulling over for a large campervan and was hit by a sudden gust of wind as it passed, toppling over as a result. We rescued his bike, celebrating jubilantly only to turn around to see my bike had fallen over in another gust. Ian was stuck supporting his bike and preventing it from falling over, whilst I looked at mine in dismay! We were saved by a couple in a passing Landie (who probably had a good laugh at us later on!) Between the four of us we got both bikes upright and supported and off we went again. We didn’t stop again, battling the winds and rain to the summit and down the other side to Applecross. The heavy mist sadly hid the steep drops off the edge of the road and much of the views. 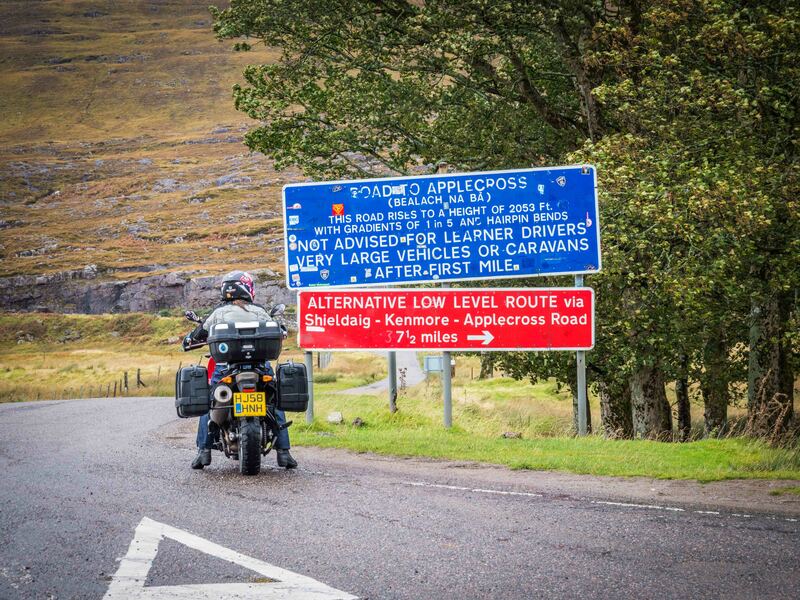 Had the weather not been so horrific, the pass wouldn’t have been too challenging. That being said we are both fairly comfortable riding steep tracks and switchbacks on our mountain bikes…. The cafe at the end of the pass was a warm and welcoming place to enjoy lunch. We chatted briefly to someone even nuttier than us and had cycled over the pass! Lunch completed, we headed back on the bikes for the 37 mile lowland route that would take us back to the beginning of the Bealach na Bà. The rain abated for some of this, and the sun shone through the clouds making the view out to sea spectacular. The road from Shieldaig to the start of the Bealach na Bà is stunning, and excellent fun to ride – definitely worth a detour/loop if you have the time. Riding beside Loch Carron, Ian became very excited upon sighting an inspection train chugging along on the opposite bank. As we crossed the tracks in Strathcarron, his excitement doubled as there it was, sat proudly in the station. Sadly, he only managed to get a quick snap of it pulling away! 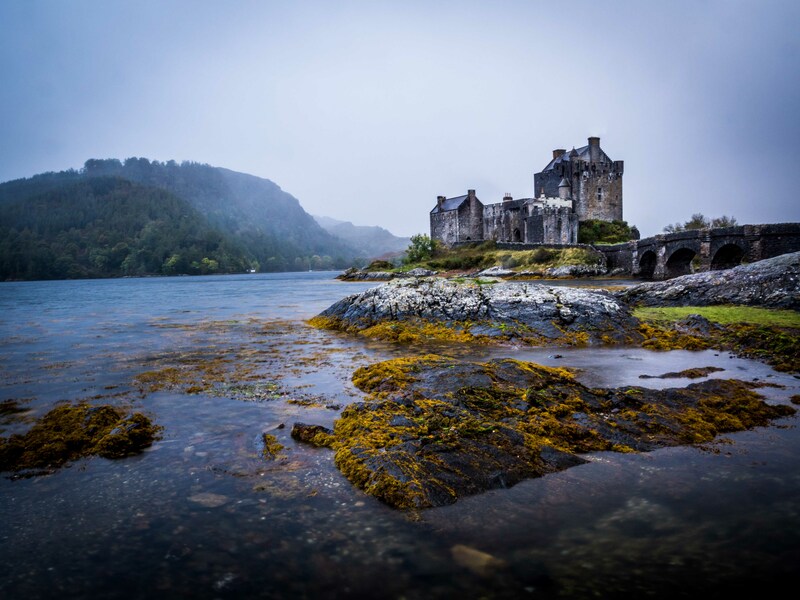 From here, we dropped south off the official route to Dornie, which is worth a visit for the beautiful Eilean Donan castle which sits on an island at the meeting of three Lochs. From here, it was a short ride up to our accommodation, Croft House Bothy, which we booked through Airbnb. We dumped our things, and headed immediately back out to find some food, but with the shops being shut settled for the Dornie Hotel. This was expensive, and having had a late lunch, we opted to just eat the starters! Back at the accommodation, we found a guest book which had recommendations for places to eat; which would undoubtedly been better! We soon had our kit drying beside a cosy fire, and got onto editing our day’s journey! The bothy was the perfect place to spend our first night on the NC500, and comes highly recommended! Looks a great trip, will you be posting the remainder of the trip? Yes, they’re coming soon. We’ve got most of them written, just some finishing touches needed.